By far my proudest shot of the wedding cake. This photograph was taken at The Arctic Club Seattle -DoubleTree by Hilton Hotel. It is undoubtedly one of the fanciest and most gorgeous wedding venue in Seattle. When I first started my career as a wedding photographer, I often saw some stunning images of a wedding venue with gold lavish ceiling when I looked for inspiration. And I said to myself, "one day I'm definitely going to shoot a wedding here. And thanks to Logan Westom who contacted me for a 2nd shooting gig. My dream finally came true. With that said, I definitely did not waste my opportunity not taking some beautiful shots. And this is one of them. The most challenging part about shooting at this venue is the limited light source available inside. Right off the bat I had to crank my ISO to minimum of 3200 because it was so dark in here. It would not have worked if I just put my speedlite on the camera and bounce it off the ceiling due to the height and the dark top. That's why I came prepared with all my gear. 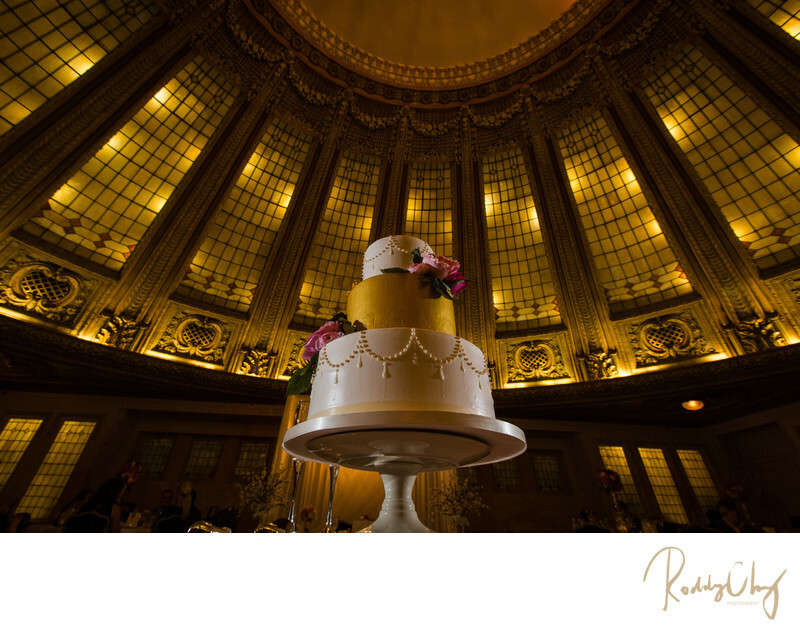 With the golden arch ceiling as the background, I was able to create this spectacular shot for the wedding cake. And ever since I published this on the web, I have got a lot of praise on this particular image! Keywords: Reception (9), wedding cake (3), Willows Lodge (3), Woodinville Wedding (3).